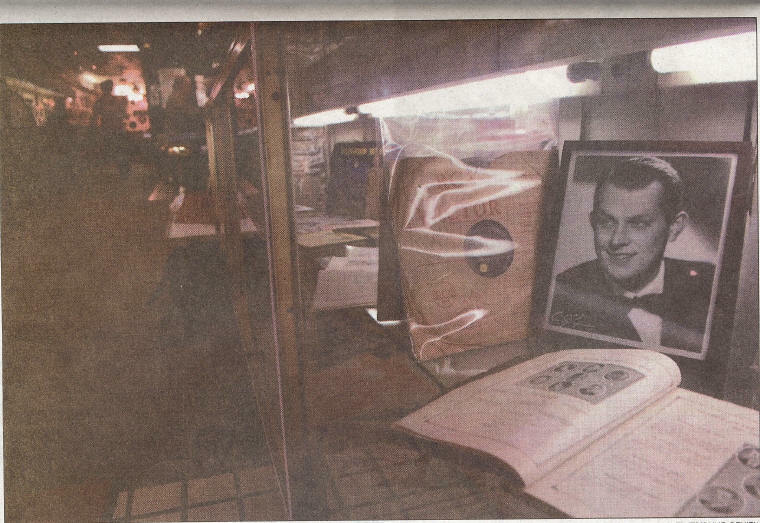 Inside the Hometown Diner, in Jeannette, a small display case contains memorabilia honoring big-band singer Vaughn Monroe. His smooth baritone voice continues to enchant his fans nearly 34 years after his death. Vaughn Wilton Monroe, trumpeter, singer, bandleader and actor, graduated from Jeannette High School in 1929. He was born in Akron, Ohio, to Mabel and Ira C. Monroe. Mabel Monroe named her son after her two favorite movie stars, Vaughn Glasser and Wilton Lackaye. Ira Monroe was born in a log house in West Virginia built in 1881 by his grandfather, a descendant of President James Monroe. 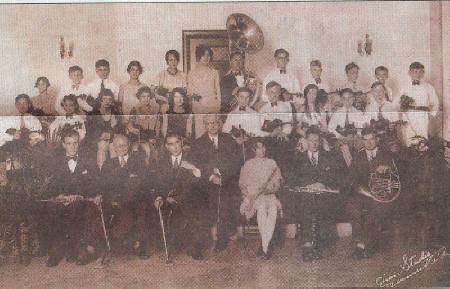 in the Jeannette Orchestra in this 1929 photo. says 1912. However, there's no question as to his love of music. Monroe was 10 years old and living in Kent, Ohio, when a neighborhood friend gave him an old trumpet. His mother told him he couldn't play it because the neighbors would complain. The young Monroe assured her they wouldn't. The next day, Monroe brought home a book of trumpet lessons and told his mother she owed a local music teacher $3.50. July 1948, Monroe told writer Joseph Kaye, "I went at my trumpet with surprising industry, for in three months I learned enough to render a solo at a Kent high school affair." His father was a research engineer in the rubber industry, and the family moved quite a bit. When Monroe was about 15, his father got a job at the Pennsylvania Rubber Co., which became the General Tire and Rubber Co., in Jeannette. junior and immediately became well known in the band, orchestra, jazz orchestra and the glee club. He also participated in basketball and track in high school and was voted senior class president. and Video store in Jeannette. Below: Howard has a display of Monroe memorabilia in his store. close friends until they realized they were in love. They married on April 2, 1940, 12 years after they first met. After graduating high school, Monroe went to work in a factory to save money for college. He enrolled in Carnegie Tech (now Carnegie Mellon University) as a voice major. At the end of his first semester, Monroe received an offer from Austin Wylie, a professional band leader, who asked him to join his band. Marshard as his manager. In the meantime, Monroe's brother, Bill, a singer and trombone player, had joined him in the band he fronted for Marshard. Monroe's first orchestra recording of "There I Go," spent three weeks at the top of the Hit Parade and his orchestra was named top college band in 1940. What became known as Monroe's theme song, "Racing with the Moon," debuted in 1941. Within the next two years, he had three No. 1 hits, "My Devotion," "When the Lights Go on Again (All Over the World)" and "Let's Get Lost." Marian Monroe often accompanied her husband when he traveled. But once their daughters Candace and Christina were born, she stayed home with them. His career also included other hits, including "There! I've Said It Again," "Let It Snow! Let It Snow! Let It Snow!," "Ballerina" and "(Ghost) Riders in the Sky." Monroe also made guest appearances on the "Ed Sullivan Show," "Texaco Star Theatre," the "Jackie Gleason Show," "The Tonight Show" and "American Bandstand." He played host to the Vaughn Monroe television show in 1950-51 and 1954, and also appeared on "Bonanza" and "The Mike Douglas Show." Movies also beckoned. 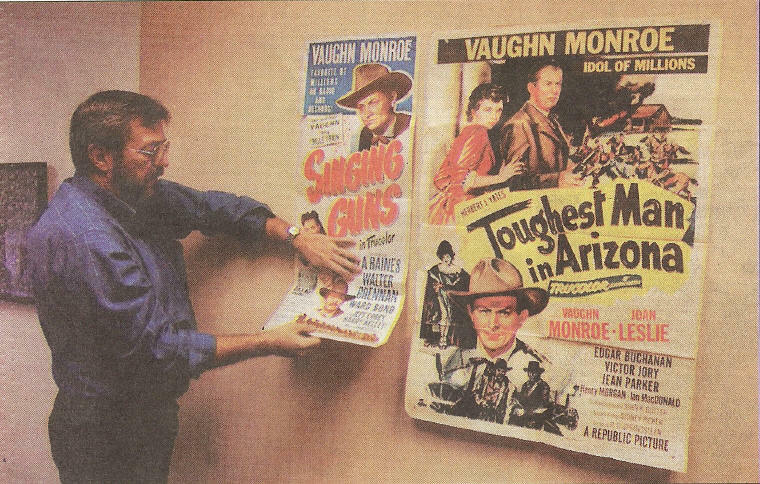 Monroe appeared in 1944's "Meet the People," "Carnegie Hall" (1947), "Singing Guns" (1950), and "Toughest Man in Arizona" (1952). Monroe could be seen in many television commercials, owned The Meadows Restaurant and Nightclub in Framingham, Mass., and co-authored "The Adventures of Mr. Putt Putt," a children's book about airplanes and flying, published in 1949. His niece, Karen Marquis, of Jeannette, remembers the Monroe family's beautiful home in Massachusetts. "We visited there when I was very young," said Marquis. "He was a very loving, gentle person. I remember my aunt and uncle coming to Greensburg on the train wearing their best clothes. We went up to meet them. It was very exciting." Marquis' mother, Katherine, was Marian Monroe's sister. Bill Monroe, of Latrobe, is the son of Bill, Vaughn Monroe's brother. "My parents divorced when I was a year and a half old," said Bill Monroe. "My uncle Vaughn still visited my mother and grandmother, and he bought me my first BB gun when I was 8 years old." Bill Monroe said his uncle went to flight school sometime in the 1930s. Vaughn Monroe revealed in the July 1948 True Stories article that he had purchased a plane, which he named Cantina after his daughters. "Uncle Vaughn was always busy touring but when he came back to Western Pennsylvania, he played at the Holiday House in Monroeville," said Bill Monroe. "In 1963, he invited us to the Holiday House and my girlfriend's parents took us to see the show. He invited me on stage and introduced me as his nephew. I was about 17 years old and embarrassed. "But I'll never forget 'Racing with the Moon,' and 'Riders in the Sky.'" Claire Schwartz of Dearborn, Mich., will never forget the first time she heard Vaughn Monroe sing. It was 1997 and her husband was a fan of the western channel on television. "He was watching a movie called 'Singing Guns,' and I sat down and caught part of it," said Schwartz. "I wondered who this man was in the movie, so I began researching him." Schwartz found a message board online dedicated to Vaughn Monroe. "I began posting messages and chatting with Lou Kohnen, of East Rochester, N.Y.," she said. "We struck up a friendship and decided to launch a Web site dedicated to Monroe." The Vaughn Monroe Appreciation Society was formally launched on Oct. 7, 2001, which would have been Monroe's 90th birthday. Monroe died on May 21, 1973 after undergoing major surgery for a respiratory ailment in Stuart, Fla. He had become ill after performing at the Kentucky Derby Ball on May 5. "The primary goal of the society is to remember Vaughn and make his music available so that others may hear his tremendous talent," Schwartz said. Since the start of the society, Schwartz said she and Kohnen have heard from Monroe's former musicians, vocalists, and their sons and daughters. "We've heard again and again that he was a true gentleman, a down-to-earth guy in a crazy business," said Schwartz, who traveled to Jeannette on Oct. 23, 2002, to obtain information on Monroe from the Jeannette Public Library and the Jeannette Area Historical Society. Several of Monroe's relatives are honorary members of the appreciation society. His daughters and widow have continued to maintain their privacy in the years since Monroe's passing. Vaughn Monroe's music has been re-released on CDs, which are available online at www.amazon.com. Monroe's version of "Let It Snow!" can be heard during the credits at the end of the Bruce Willis' "Die Hard" movie. 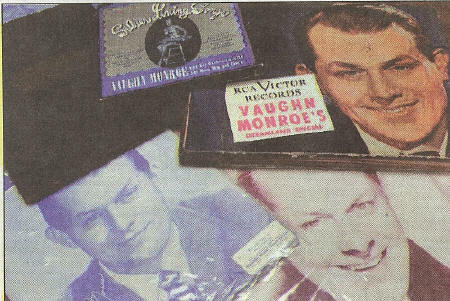 Sound clips of his recordings are also available on the Vaughn Monroe Appreciation Society's Web site at www.vaughnmonroesociety.org. The society is playing host to a special gathering of Monroe fans in Boston on May 17-20. Log on to the appreciation society's Web site for more information.